Cacti Computer Services is marketing a large (11″ × 21″), pressure sensitive keyboard with widely spaced key contacts to enable users with limited finger and hand control to operate a microcomputer. 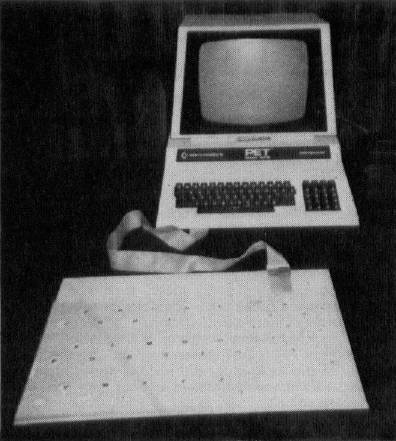 The system consists of large keyboard, interface to plug into the computer, connecting cables, plastic mask, and a driver routine to permit the large keyboard to function as a regular keyboard. Once the driver routine has been loaded, both the regular keyboard and the large keyboard function to run commercially available software without modification. The system can be installed and operated with no technical knowledge required. Several keyboard layouts are available, and custom arrangements will be made at no extra charge. The system is presently available for immediate delivery for use with the Commodore PET/CBM at a cost of $525 (U.S.), and is being developed for the Apple. Interfaces may be developed for other systems, depending upon demand.